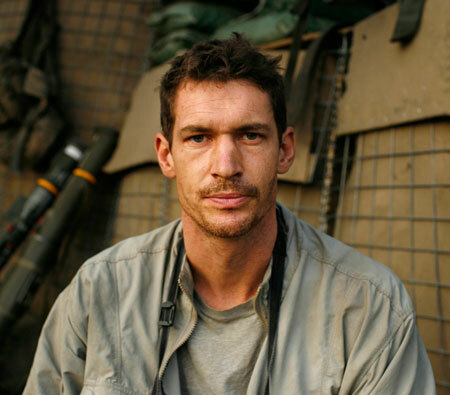 When thinking about Memorial Day, and our soldiers around the world, I keep coming back to Tim Hetherington and the difficult and meaningful work that he dedicated himself to. Tim was killed on April 20th by a rocket propelled grenade while photographing in the front lines in Misrata, Libya. As a photographer and film maker, he was our eyes, our consciousness, our interpreter of conflict, war, and death. He also brought a humanity and an amazing life spirit to his work. He gave his life for this vision and I want to spend today, not only thinking of Tim, but of those 18 year old young men and women who are too young to deal with the nightmare of war. The work was made in 2007-8 while I was following a platoon of US Airborne Infantry based in the Korengal Valley of Eastern Afghanistan. This is a single screen version of the original 3-screen installation that was first show in New York in 2009 (the original 3-screen version was designed as an immerisve installation, and not for the small screen). Sleeping Soldiers_single screen (2009) from Tim Hetherington on Vimeo. Tim was born in Liverpool, UK, studied literature at Oxford University and later, photojournalism. At the time of his death, he was living in New York, but was traveling the world as a photo journalist. He is known for his long-term documentary work. He was also nominated for an Academy Award, along with Sebastian Junger, for his documentary film, Restrepo, about a platoon of soldiers in Afghanistan. ‘Diary’ is a highly personal and experimental film that expresses the subjective experience of my work, and was made as an attempt to locate myself after ten years of reporting. It’s a kaleidoscope of images that link our western reality to the seemingly distant worlds we see in the media. This entry was posted in Contemporary Photography, L E N S C R A T C H, Uncategorized and tagged Airborne Infantry, Bit By Bit, Contemporary Photography, Documentary Work, Eastern Afghanistan, Film Maker, Globalizing World, Liberian History, Life Spirit, Liverpool Uk, Meaningful Work, Original 3, Oxford University, Photo Journalist, Photographer, Photographers, Photographs, Photography., Rocket Propelled Grenade, Soliders, Thames And Hudson, Thames Hudson, Tim Hetherington, Umbrage Editions, Vimeo on May 30, 2011 by Aline - lenscratch.blogspot.com/.